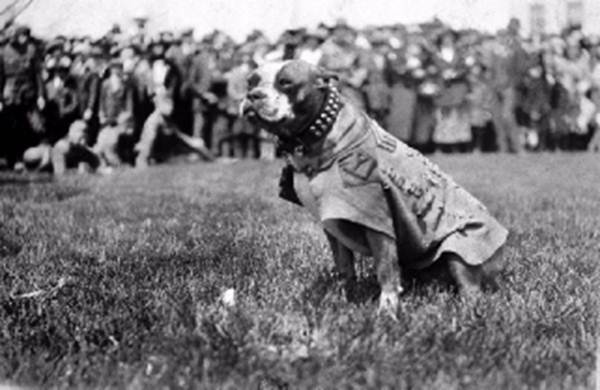 A few month’s back I wrote a short piece on Stubby, America’s first and most decorated war dog who happened to be a Pit Bull (no surprise to those of us who live with them). With Bullies once again getting hammered in the press, here’s a fuller picture of this amazing solider. Sgt Stubby, was the most decorated war dog of World War I and the only dog to be promoted to sergeant through combat. One day he appeared at Yale Field in New Haven, Connecticut, while a group of soldiers were training, stopping to make friends with men as they drilled. Corporal Robert Conroy, developed a fondness for the dog. He named him Stubby because of his short legs. When it became time for the outfit to ship out, Conroy hid Stubby on board the troop ship. To keep the dog, the private taught him to salute his commanding officers warming their hearts to him. Stubby served with the 102nd Infantry, 26th (Yankee) Division in the trenches in France for 18 months and participated in four offensives and 18 battles. The loud noise of the bombs and gun fire did not bother him. He was never content to just stay in the trenches but eagerly went out, searched and found wounded soldiers. Stubby entered combat on February 5, 1918 at Chemin Des Dames, north of Soissons, and was under constant fire, day and night for over a month. In April 1918, during a raid to take Schieprey, Stubby was wounded in the foreleg by the retreating Germans throwing hand grenades. He was sent to the rear for convalescence, and, as he had done on the front, was able to improve morale. When he recovered from his wounds, Stubby returned to the trenches. After being gassed and nearly dying himself, Stubby learned to warn his unit of poison gas attacks, continued to locate wounded soldiers in no-man’s land, and since he could hear the whine of incoming artillery shells before humans could, he became very adept at letting his unit know when to duck for cover. He was solely responsible for capturing a German spy in the Argonne. The spy made the mistake of speaking German to him when they were alone. Stubby knew he was no ally and attacked him biting and holding on to him by the seat of his pants until his comrades could secure him. Following the retaking of Chateau-Thierry by the US, the thankful women of the town made Stubby a chamois coat on which were pinned his many medals. There is also a legend that while in Paris with Corporal Conroy, Stubby saved a young girl from being hit by a car. At the end of the war, Conroy smuggled Stubby home. 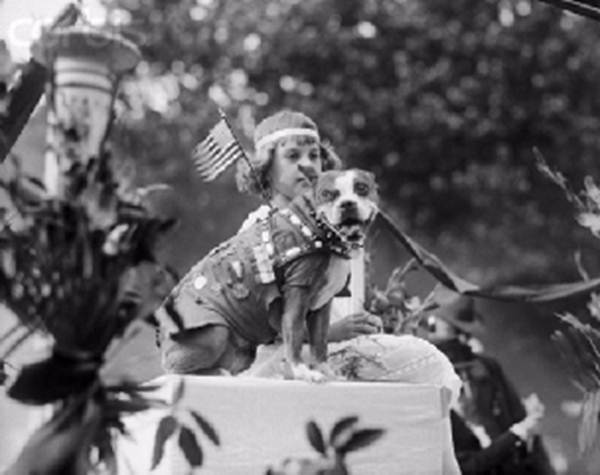 Stubby became a celebrity and marched in and normally led, many parades across the country. He met Presidents Woodrow Wilson, Calvin Coolidge, and Warren G. Harding. Starting in 1921, he attended Georgetown University Law Center with Conroy, and became the Georgetown Hoyas’ team mascot. He would be given the football at halftime and would nudge the ball around the field to the amusement of the fans. Stubby was made a life member of the American Legion, the Red Cross and the YMCA. In 1921, the Humane Education Society awarded him a special gold medal for his service to his country. The medal was presented by General John Pershing. In 1926, Stubby died in Conroy’s arms. His remains are featured in “The Price of Freedom: Americans at War” exhibit at the Smithsonian in Washington DC. Stubby was honored with a brick in the Walk of Honor at the United States World War I monument, Liberty Memorial, in Kansas City at a ceremony held on Armistice Day, November 11, 2006. ← "DON’T BLAME THE DOGS…BLAME PEOPLE"
Amazing story. I had no idea there ever was a Stubby. How could only one dog do all this?